Our Hematology Program is one of the largest pediatric programs in the country. We care for children and young adults with a wide range of blood disorders—from the most common to those rarely seen outside of the top centers. Because of our large size, we are able to offer programs with teams of providers dedicated to each of the major types of childhood blood disorders. This degree of specialization means that every child is cared for by a team that is focused solely on his disease. Medicines: May include growth factors to help blood cell productions, drugs that inhibit blood clot formation, pain medications or other drugs. Blood transfusions: The process through which a person receives donated blood. Common blood transfusions include red blood cell, plasma and platelet. Blood and marrow transplant: A BMT is the only cure for children with sickle cell disease. Developmental therapeutics: We offer some of the most promising new treatments for children with blood disorders. We are the largest pediatric hematology program in the country, including the largest pediatric sickle cell disease program. Combining the latest proven technology and research with a caring, child-friendly approach, makes the Aflac Cancer and Blood Disorders Center a top choice for the treatment of common and complex blood disorders. 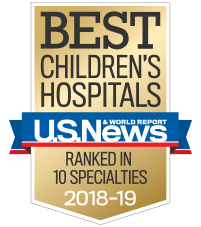 Why is the Aflac Cancer and Blood Disorders Center of Children’s Healthcare of Atlanta the best choice for childhood blood disorders? We are the largest pediatric hematology program in the country, caring for more than 3,000 patients each year. We are a designated Comprehensive Thalassemia Treatment Center, one of only nine in the country. We are a national leader in transplanting children with sickle cell disease and have cured more than 70 children. We are one of the most active centers in the U.S. in pediatric clinical trials. We offer kids and teens access to more than 300 clinical studies, including some of the most novel treatment options in the U.S.